The crisis precipitated by the decision of the employees' association of Uttarakhand Jal Vidyut Nigam Limited (UJVNL) to go on an indefinite strike today, which would have led to the closure of all hydropower houses in the state, has temporarily been averted with the assurances given by the Managing Director (MD) that all their demands will be accepted by December 25. The Mussoorie Dehradun Development Authority (MDDA) has decided to withhold five out of a total of 48 flats near the ISBT which will be sold out through draw of lots in the MDDA complex tomorrow. In a move aimed at ensuring proper conduct of MLAs, Uttarakhand Parliamentary affairs Minister Indira Hridayesh today called for the formation of ethics committee in the Uttarakhand legislative assembly on the lines of the Rajya Sabha. Col KL Dewan, (retd) of 5/9, Gurkhas and Intelligence Corps and father-in-law of Brig KG Behl (retd), president, Dehradun Ex-Services League, died here today. Satish Kumar, a small scrap dealer, was injured in a blast at the Miyawala locality of Doiwala today which occurred when he was removing a metal portion in the rear of an old rusted refrigerator in a shop. He was later admitted to Doon Hospital. He is out of danger. A total of 29 cadets of the Army Cadet College (ACC) wing of the Indian Military Academy (IMA) graduated and were awarded degrees amid presentation ceremony at the renowned Chetwode Hall of the academy here today. Chief Minister Vijay Bahuguna said today that women had played an important role in accelerating inclusive development. He further said the female literacy rate in the state was high and women’s participation was necessary for the success of government-development projects. Bahuguna maintained that people should know about the welfare programmes initiated by the Centre and the state government. Chief Minister Vijay Bahuguna speaks at a seminar organised by the Skoch Development Foundation in Dehradun on Friday. Chief Minister Vijay Bahuguna today hoped that apart from Information Technology and Space Science, geo-spatial technique could accelerate the economical development of Uttarakhand. The Chief Minister was addressing the inaugural session of a seminar on ‘Geo-Enabling Uttarakhand: Opportunities and the way forward’. 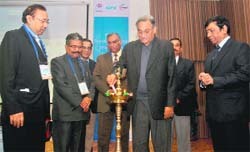 Chief Minister Vijay Bahuguna inaugurates a seminar in Dehradun on Friday. Unison World School became part of the nation-wide reading activity that was conducted from 12 noon to 12:30 pm on the school campus here today. The 100th batch of the Army Cadet College (ACC) wing of Indian Military Academy (IMA) passed out here today. The ACC has its roots in Kitchener College set up by Field Marshal Birdwood in 1929 at Nowgaon, Madhya Pradesh. The wildly grown nettle leaves, called Kandali in the Garhwali language or ‘bichu ghas’ in Hindi, have found a way to the dining tables of residents and tourists alike, who are relishing every bite of the leaves despite its stinging properties. MD GP Patel had talks with the representatives of the association in the morning. Some of the demands are to be cleared in the board meeting to be convened on December 21 on UJVNL premises whereas others are to be approved at the state government level. Patel said the members of the association had been assured that all their demands would be fulfilled by December 25. He said the management had sought time till December 25 to work on their demands. The decisions pertaining to arrears or emoluments and bonus will be taken in the board meeting whereas those concerning time-scale promotion, enhancement of pension and the provident fund scheme will be cleared at state-government level. 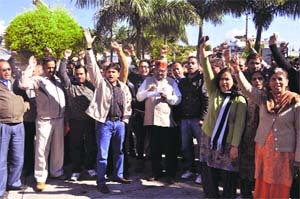 General secretary of the association Rakesh Sharma said it was a difficult decision to opt for an indefinite strike. Since the management had also shown support by giving concrete assurance to them, they too had agreed to give time to the management to take action on their words. He said the employees would finally resort to strike if the management or the state government did not stick to their promises. This change at the last minute will certainly narrow the scope and dampen the spirits of some buyers. Vice-Chairman, MDDA, RM Sundaram, said, "Initially, we had planned to sell all 48 flats, but later it was felt that we might need some flats to rehabilitate those who could be removed during the process of widening of roads, crossing or any other similar purpose. The entire city is passing through many such changes at the moment. One flat out of five will be given to a resident of Gandhi Road whose house on the corner side is obstructing the flow of the traffic." Sundaram said the plan of holding the draw of lot through electronic system too had been shelved and now manual lottery system would be replaced by it. He said people might have been suspicious on the operation of electronic system, hence the public themselves would be made to pick up a paper slip to announce the names of the winners. According to Secretary Banshidhar Tiwari, the lucky ones would have to deposit the prescribed sum within a period of three months. Owing to the fact that the prices of the flats have been kept low, the buyers would not be permitted to pay the amount in many instalment over a period of time. This certainly may pose difficulty for some to arrange the amount in a short period of time, but then hundreds of other aspirants are also eyeing for such an opportunity to catch. It is after a gap of seven years that the MDDA has come up with a housing scheme. Distraught over the exorbitant prices of flats built by private builders, people too have shown good response and 2,000 forms have been filled for these flats, which have been priced cheap at Rs 14 lakh for ground floor and Rs 10 lakh for first and second floor. The flat consists of one bedroom and one drawining-dining set. These flats are built to rehabilitate the tenants and owners who lived on the top stories of the shops on Chakrata Road, which were later dismantled to widen the road. Expressing concern on the improper conduct of MLAs in the house, the minister said, “The MLAs can be seen approaching the well of the House far too often and at the slightest provocation. They should desist from such a practice,” she said while speaking at the orientation workshop for the MLAs, under way here. She urged the MLAs not to disrupt the proceedings of the House by interrupting the speech of the members but pay attention to what was being said. Former MLA Ambrish Kumar delivered a lecture on adjournment motion and delved on various aspects of the motion and it’s utility. Senior BJP leader and former MLA Munna Singh Chauhan and former Uttarakhand Parliamentary affairs Minister Prakash Pant also delivered a lecture on the conduct of the MLAs in the house. He was a stalwart of Dehradun ex-servicemen, who knew all the rules and regulations and helped ex-servicemen, especially the war-widows, to get them their dues. Station House Officer Kamlesh Kumar, Doiwala said, "Satish Kumar was beating up a metal portion, attached in the rear of a refrigerator which also contained some gas, to remove it from the refrigerator. While doing so, a sudden blast took place. The shrapnel from the blast got embedded in his body. The owner of the shop was also sitting at some distance but remained unharmed. Kumar was rushed to Doon Hospital and provided timely treatment. He is out of danger now." The SHO thrashed another rumour that Satish Kumar was injured while beating up the shells of cartridges which he collected from the fire range at Raipur. From among the 29 cadets, 14 of them hail from science stream and 15 humanities stream. These degrees were conferred on the cadets by the prestigious Jawaharlal Nehru University, New Delhi. The ceremony was presided over by Lt Gen Manvender Singh, Commandant, Indian Military Academy. The Army Cadet College trains the selected personnel from the ranks. Brig GK Chopra, head of the academic department, presenting the college report, highlighted the high standards and admirable academic performance shown by the cadets of the graduating course. The Commandant, Indian Military Academy, in his convocation address to the graduating course, congratulated the cadets and said, “As you have performed well during your training at the Army Cadet Wing, you need to continue with added zeal during your training at the IMA. You must make an endeavour to continue to be pro-active thus proving to one and all that you are not only good but even better than your peers in all spheres. You must take pride and draw strength from the background and difficulties from which you have risen because of your own hard work ability and dedication." He added, "Knowledge knows no end, it only has a beginning. Our efforts have not only been aimed at instilling that awareness in you but also to make you realise as to how much still remains to be learnt. I would like to take this opportunity to remind you that ex-ACC cadets have done us proud over the years by winning the highest gallantry awards, the Param Vir Chakra (PVC) and the Ashok Chakra”. Later,he gave away medals to the award winners. 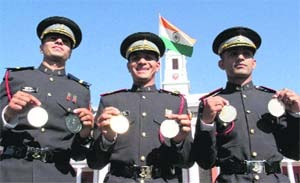 The award winners are Chief of Army Staff (COAS) gold medal - PK Tiwari, COAS silver medal-Sanjay Kumar, COAS bronze medal - Ramsukh Dukhiya, Commandant’s silver medal, first in the service subjects - Sanjay Kumar, Commandants’ silver medal, first in humanities stream-PK Tiwari, Commandants’ silver medal, first in science stream- Ramsukh Dukhiya. On this occasion, Lt Gen Manvender Singh also awarded the Commandant’s Banner to the Bogra Company. It is awarded to the company, which excels in varied competitions like sports, academics, camps, debates and discipline. At the end, the Commandant complimented the staff and the faculty members for their diligent efforts for moulding the cadets into potential officers. At the end he congratulated all parents and extended his felicitations to the future Gentlemen Cadets. The Chief minister was speaking as the chief guest on ‘Samavesh: Accelerating inclusive growth’, organised by Skoch Development Foundation at the Survey of India Auditorium, here today. He said development rate of the state was 11 per cent. “There had been reasonable development in various sectors after the formation of the state. However, there is a need to provide benefits to women from the SC/ST categories, backward areas, hill region and border areas,” he said. Bahuguna said the state government had made a provision for a separate fund for the development of backward areas and had also constituted Horticulture Marketing Board for marketing of goods produced in the hill areas. Bahuguna said to pay subsidy amount directly to the general public to provide relief, the state government had chalked out a plan for which it was mandatory for all to have a bank account. Hence, stress was also being given to financial inclusion, considering it one of the important aspects of the inclusive development. He said the Centre had consented to adopt cluster approach to extend bank services in the hill region where the set norm of population was not practical. He said women could play an important role in savings. 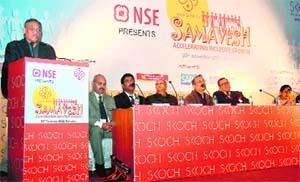 Sameer Kochar, Chairman, Skoch Group, while elaborating on ‘Samavesh’, said its first phase was being executed at Chakrata, Kalsi and Dehradun under which people were made aware of banking, marketing and financial literacy. Also present on the occasion were Gurusharan Dhanjal, CEO, Skoch Group, K Kamla, Senior Vice President, National Stock Exchange, Avdhash Kaushal, Chairperson, RLEK, Ashok Aneja, PNB Circle Head, Gyan Bhushan, CGM, SEBI, and Hrushikesh Panda, Additional Secretary, Panchayati Raj, the Government of India. Chief Minister Vijay Bahuguna today hoped that apart from Information Technology and Space Science, geo-spatial technique could accelerate the economical development of Uttarakhand. The Chief Minister was addressing the inaugural session of a seminar on ‘Geo-Enabling Uttarakhand: Opportunities and the way forward’. The seminar was being organised by the Federation of Indian Chambers of Commerce and Industry (FICCI) in association with the Uttarakhand Space Application Centre (USAC) and the Indian Institute of Remote Sensing (IIRS). “In the present era, the utility of geo-spatial technique has increased, especially in Uttarakhand, which is geologically sensitive,” the Chief Minister said. He said with the help of statistics obtained from the geo-spatial analysis, challenges linked to environment and economy could be resolved. He said the geo-spatial technique could play an important role in natural disaster management, urban development, land reform and many other areas. Bahuguna observed the geo-spatial technique could prove useful in security measures in Uttarakhand that shares the international borders. He urged the organisers to send the recommendations of the seminar to the state government. Rajesh Mathur from FICCI task force elaborated about geo-spatial technique through visual presentation. He said along with the population inflation and development, challenges like environmental pollution and contraction of natural resources too were surfacing. “Geo-spatial technique can play an important role in meeting these challenges,” he said. He said the FICCI had already taken steps in the direction. FICCI’s director general Dr Arbind Prasad assured that the FICCI would be happy to continue its association with Uttarakhand to help them establish the use of this technology across the user departments and the industry sectors. Uttarakhand Space Application Centre director Dr MM Kimothi hoped that the recommendations from the seminar would provide a useful roadmap for geo-enabling Uttarakhand. Uttarakhand Science and Technology secretary RC Pathak and director IIRS Dr YVN Krishna Murthy also spoke on the occasion. Scholastic launched ‘READ: One nation reading together’ campaign in the school, which aims at fostering good reading habits in children and to make excellent books available to those who have limited access to it. Schools from all over the country were invited to celebrate the pleasures of the written word by spending a specified amount of time reading for fun and engaging in book-related activities. Reading is an important skill that needs to be developed in children. They are influenced by and imitate the world around them. While a steady diet of violent cartoons may have a detrimental effect on children's development, carefully chosen stories and books can have a positive influence on children, sensitising them to the needs of others. Books can encourage children to be more cooperative, to share with others, to be kind to animals and to respect the natural environment. AC Grayling had rightly said, “To read is to fly. It is to soar to a point of vantage which gives a view over wide terrains of history, human variety, ideas, shared experiences and the fruits of many inquiries." Continuing with the primary motive to enable competent Indian soldiers to become commissioned officers, Kitchener College was rechristened as Army Cadet College at Nowgaon post Independence and was inaugurated by then Defence Minister VK Krishna Menon and Chief of Army Staff Gen KS Thimmaya on May 16, 1960, with Col Hardayal S Sandhu as its first Commandant. In 1977, the ACC was shifted from Ghorpuri, Pune, to Dehradun and was attached to Indian Military Academy as an additional wing. In July 2006, it was made an integral part of IMA as the 5th Battalion named Siachen Battalion. The alumni of ACC have excelled in all spheres of military activities. They have etched stories of their heroic valour in battlefields around the world. Many of the ACC pass outs are recipients of the India's highest gallantry award Param Vir Chakra and two Ashok Chakras with many other laurels.aThey also have 01 Military Cross, 01 Yudh Seva Medal and 05 Sena Medal. Two Army chiefs namely Gen Mohammad Musa of Pakistan and Gen Smith Dun of Myanmar are also the alumni of ACC. Foreign tourists savouring ‘Kandali ka saag’ prepared by a few hoteliers are finding it to get over the desire for having more. The popularity of the dish has given air to the demand of preserving the traditional knowledge and promote such indigenous dishes among the foreign tourists on large scale. According to local resident and hotelier Anil Godiyal, his family back home used to prepare ‘kandali ka saag’ frequently, but after he took up a job in Mussoorie and shifted here, it became a rare dish for him. However, introducing the ‘kandali ka saag’ to his children once again has given a new dimension to their learning about the traditional food. Principal of Mussoorie Public School Mukesh Lal, while elucidating the preparation of the dish, said it was prepared like spinach to a certain extent and eaten as a form of stew or cooked in oil with only salt and no other spice mixed in it. To take the sting out of the nettle leaves, it is burned on amber. Following that, the leaves are cut and put in the boiling water along with another grass called ‘khatti mithi’. A little amount of rice is put in the utensil so that the leaves do not stick in it. The mashed leaves are then garnished in the oil, garlic and salt for taste and then eaten with chapatti or rice. He further said it was a seasonal food and usually eaten in winters. At some places it was also used as a delicious pot herb, he said. According to Yasmine Fernery Director Bimol Sharma, the scientific classifications of the plant are magnoliophyta of class magnoliopsida and belong to the family of urticaceae. 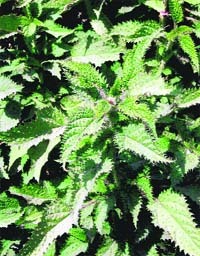 The order of these leaves is urticales with genus from urtica. They are mostly herbaceous perennial plants but some are annual and a few are shrubby. The most prominent member of the genus is the stinging nettle (urtica parviflora) found in the Himalayan lower altitudes like Mussoorie. The nettle leaves are basically food for caterpillars. Sharma further said the nettle leaves have a lot of medicinal value and contain high levels of important nutrients and have a long history of being used as a potent herb. This herb is one of the natures best nutraceuticals, containing protein, calcium, phosphorus, iron, magnesium and beta-carotene along with vitamins A,C,D and B complex, all in a form that is easy for the body to use. Sharma opined that the stinging nature of the leaves was due to the presence of histamine on the bristles that leaves a stinging sensation when its leaves and the stem were touched. The stinging nettle contains natural antihistamines and anti-inflammatory, including quercetin, that open up constricted bronchial and nasal passages, helping to ease hay fever and sinus allergies. Canadian tourist and anthropologist Jimmy, who has been researching on the traditional food habits in the state, said he has found ‘kandali ka saag’ prepared by locals in accordance with the traditional knowledge passed on from generations found the dish enriching and easy to digest. Jimmy further opined that in the age of the processed food, which was being bombarded to the remotest corners of the country, eating such dishes was refreshing. He was of the view that this traditional knowledge of the food habits in the state should be preserved and duly documented after consulting traditional people so that the future generations could also savour it. He also said general health of the people would improve if people from cities start eating such traditional dishes and people from villages be made to understand the importance and validity of information about the natural heritage that was present in the state in abundance.